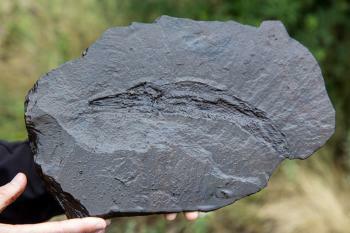 The Messel Pit Fossil contains unique fossils from the Eocene dating back 50 million years. 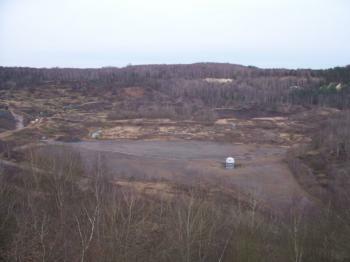 The Messel Pit is a disused quarry, in an ancient lake bed, in which bituminous shale was mined. The first animal fossil remains discovered were that of a crocodile found in 1875. Subsequent excavations have led to the identification of 40 species, including mammals, birds, reptiles, fish and insects. The pit first became known for its wealth of fossils around 1900, but serious scientific excavation only started around the 1970s, when falling oil prices made the quarry uneconomical. Commercial oil shale mining ceased in 1971, and a cement factory built in the quarry failed the following year. The land was slotted for use as a landfill, but the plans came to nought, and the Hessian state bought the site in 1991 to secure scientific access. A proper visit to this WHS should consist of two parts: to the Messel Pit itself and to a museum where the fossils discovered there can be seen. So my day started in Darmstadt, at the Landesmuseum. There they have two (small) exhibitions on the Messel fossils. One with the bigger animals (like a crocodile) and one with the insects and other tiny animals. Especially on these you can still see the colouring which is so remarkable about the Messel findings. After lunch, I drove to the Pit itself. There are signs to Messel from (parts of) Darmstadt: it's about 10 kms. For the guided tour about 50 to 60 people had gathered at the small infocenter. We even had to be split into groups: a remarkable large crowd for such an inconspicuous place. I had thought that only the WHS-addicts would make it here (a bit like the Neolithic Flint Mines in Belgium). The story of the guides absolutely makes a visit worthwhile: without it I wouldn't advise going (the viewing platform doesn't tell you much about what has happened here). Only that way you can imagine the lake, its volcanic origins, the wild animals (even including a tapir) swimming or drinking, the rain forest, the mediterranean climate. 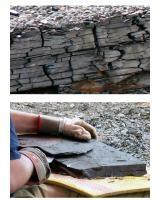 And the special condition of the oil-shale lake bed, which made it possible to conserve the fossils so well. 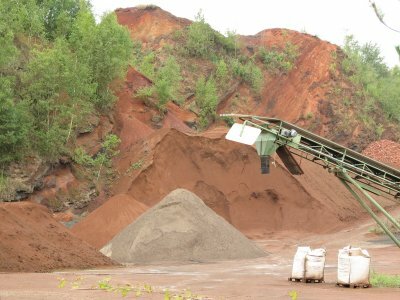 The Pit's more recent history, from not-too-productive mine to (proposed) garbage dump to WHS and recovering biosphere, is an interesting story also. 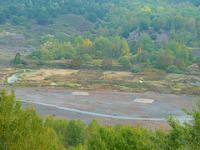 Visiting the Messel Fossil Pit is a little bit tricky because, in some ways, there’s not a lot to see. Most of the important stuff – the fossils – has either been taken away or is still underground, waiting to be discovered. But it is still worth going because you do get good access to the site. It’s possible to go on a guided tour into the pit area where you can see the oil shale and the hole in the ground where a lot of the work is happening. In the warmer months, there are usually researchers on the site digging through the rocks to find fossils and you can watch them work. There are also some fossils or replicas that are on the site to see and touch, which gives you a good sense of what the scientists are looking for here. It’s estimated there are tens of thousands more fossils to find here so you may be lucky enough to witness a big discovery. A lot of thought has also gone into the modern museum on the site and it’s an excellent place to visit. There are comprehensive exhibits about the formation of the pit and the process of exploration. There is also a collection of significant fossils that have been found here. It’s incredible to see how well preserved they are, considering they have been underground for up to 50 million years. On a pleasant spring day, I took the train from Frankfurt to Darmstadt and on to Messel to see the well-known (at least among paleontologists and WH collectors) Messel Pit. There is a very nice visitor centre where somne of the finds are exhibited and the tour I joined was quite informative (led by a paleontology student), but also very crowded, and we could also cautiously touch some actual finds, but of course, as the treasures that make Messel famous are either in a museum or still underground, you can't really see much except some features in the landscape - the remains of the volcanic lake that buried the animals eons ago and which now are the reason for Messel's prominence. The next day, I went to the Senckenberg Museum in Frankfurt to complement my visit, as many fossils from the pit are actually exhibited there. All in all, it was a nice window into a world about which I had previously known very little. I visited this WHS in October 2013. The new visitor centre was less interesting than others I have visited in Germany and throughout Europe (for example for Monte San Giorgio). However, the informative video and borehole experience were worth watching. They compliment the 1 hour visit of the pit (with a German guide) and at least they have English subtitles. The price of a ticket for the visitor centre only is rather expensive (10 euro) for what you get. There is also a viewing platform above the pit just in case you miss the 12.30 or 16.30 visits. The list of nature WHS outside the centre was a treat to see. All in all, I enjoyed my visit and the fact that this WHS could have become a mere dump made me feel proud that I supported such an outstanding natural WHS. A comment about the Darmstadt Museum – we looked into visiting it, but, in common with so many sites in Germany, it was being re-furbished and was closed (Sep 2013)! There is however a museum (free entry!) in the village about 3kms north of the Pit if you want to see more after the museum at the visitor centre http://www.messelmuseum.de/index_museum.html. We fitted in a quick look round the Visitor Centre Museum which had a surprising “Disneyworld” type “ride” deep into the Earth (see later!) before we joined around 30 people on the tour. This started with a 10-15 minute talk (in German) just outside the door of the museum telling us what the museum already said and also that there wasn’t enough time on a 1hr tour to go right into the Pit! We eventually made it past the locked gates into the pit (with another few minutes talk in front of them!) and stopped at 2 more locations for further explanations – the first not really much further in to the Pit at all and the second to look at a pile of shale and smell the oil (originally the Pit was mined for oil shale). Further in the distance we could see a couple of awnings with researchers working on the deposits and were then taken further down to see them with the warning that we couldn’t spend long there – so, whether such a visit is normal on the 1hr tour, I don’t know (or even if the researchers are there every day). For us this was undoubtedly the highlight of the tour. The beds they were cutting into were clearly visible (photo 1) and it was interesting to see the researchers using knives to split the rock into thin slices and looking for fossils (Photo 2). We didn’t see them discover an “Ida” (Messel’s iconic fossilized pearly primate discovery – Darwinius Masillae) but there were little beetles and plant remains being found and being carefully trimmed and put to one side in water to preserve them. Next we were taken to a small cabin and were shown something of the process of preservation and casting which the fossils undergo. 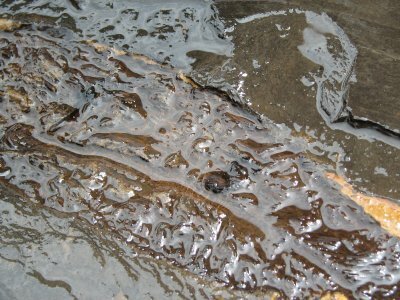 The fossils degrade very quickly once exposed and have to be stabilized quickly by a resin cast which incorporates the original on one side which is then painstakingly exposed by removing the remaining rock. See here if you are interested - http://www.paleodirect.com/pgset2/fakemesselfossils1.htm. Back in the museum we had a second “ride”! This consists of a small circular room with a 360 degree wall projection simulating a “ride” as in a descending elevator on a drill bit deep into the rock to extract a “core” which is on display outside –with explanations at each level. The museum had a fair number of fossils on display and, if they might not have been as comprehensive as those in the Darmstsadt museum, we were reasonably satisfied – those showing the process of evolution across one family of fishes to exploit varying niches, were particularly noteworthy. The view from the observation deck over the Messel Pit is quite uninteresting, you just see a big hole of about 500 meters in diameter. That this place is an important palaeontological site and that excavations still take place is not evident. As the other reviewers I also recommend to take a guided tour. There are tours every day from April to October. Several years ago I attended the one-hour tour and on my last visit (in 2012) the two-hours tour. Both guides were excellent. In fact, there is not much to see, but they made the best of it. I learned a lot about the origin of the fossils, the geology, and the recent history of the pit (oil shale mining, the proposed garbage dump which was prevented by public opposition, and finally the WH inscription). During the two-hours tour we walked to the artesian well at the bottom of the pit and we also went past the site of the current excavations. The guide explained the technique: a large block is cut out from the oil shale and is carefully split with a flexible blade. If a fossil is found, it must be immediately stored in water to protect it from drying out. We were also searching for fossils in the overburden. That was a lot of fun, not only for the children. 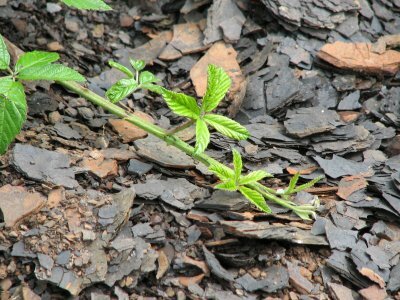 And with some luck you can find a part of a plant or a small insect. The fossils were formed 47 million years ago (Eocene) over a period of 1.7 million years. At that time the place was a rainforest. A volcanic eruption created a water-filled crater (maar), which was refilled by sedimentation of dying algae, dead animals and mud. Due to the relatively great depth in relation to the small surface, water exchange by convection occurred only in the upper layers. This led to a lack of oxygen at depth and therefore dead animals and plants were preserved and petrified in deeper layers. The existing pit is the result of the oil shale mining and is about 70 metres deep. The fossil layer is in total about 200 metres deep, so there is still plenty of work for the palaeontologists. Messel is known primarily for the ancestral horses, of which about 70 specimens have been found. There are also other mammals, crocodiles, many birds and bats. Large animals are rare, but almost every day they find a bowfin, every hour a small fish, and countless insects and part of plants. The state of conservation of the Messel fossils is outstanding. Sometimes even parts of the soft tissue were preserved, like parts of fur or feathers, stomach contents, feces and even wings of insects along with their original colouring. In 2010, a new visitor centre was opened. The permanent exhibition informs about volcanism, geology, the formation of the pit and the research activities. However, the entrance fee of 10 Euros (without the tour to the pit) is relatively high. There are also about a dozen fossils (photo shows a turtle), but the best examples can be seen in the Landesmuseum in Darmstadt. 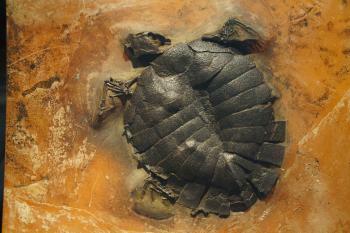 The museum in Messel also shows some fossils. On some weekends in summer, they demonstrate how a fossil is prepared. At our visit we were able to watch the preparation of a turtle. The process is really complicated, the preparation of a turtle takes about 3 weeks. All in all, the Messel Pit is worth a visit, they have done a lot to make a visit interesting, and the guided tours are excellent. If you like fossils, then call the folks at Messel (06159-717535) to schedule a tour of the fossil pits in German or English. The tour takes about one hour. The paleontologists speak excellent English. The tours are available on weekends from Easter until the end of October. Also, don't expect to see dinosaurs. These fossils are too recent for that. Instead, you will see whole crocodiles, turtles, fish, manatee bones, insects, and other things from the rain forest that was here 49 million years ago. I thought it was pretty cool! But, hey, I like that kind of stuff. One final thing: in spite of what they say on their website about how easy it is to find, we had a very difficult time. Best thing is to take Dieberger Strasse out from Darmstadt Zentrum. The pit is about 10-12 km from the Zentrum. And don't depend on the brown signs; they are almost non-existent until you get right up to the turnoff for the pit. In March 2005 I made three friends of mine stop by at Messel when we had a three day trip to Frankfurt and surroundings. Well, it was a nice sunny day and we could go the whole way (information tableaus about the Messel Pit Fossil Site along the way) to a platform from where we could see the pit. The info tableaus were quite good, but the pit itself was kind of disappointing. Unfortunately the museum wasn't open as we've been there on a weekday during winterbreak (until the end of March, from 1st April on it's also opened on various weekdays). All in all the pit itself isn't worth a visit, but the museum shall be nice. This was a site that I really had no preparation for visiting and it was a split second decision at Darmstadt station that brought us here instead of Lorsch. What we didn't realise was that the fossil site is not open between November and April. When the information centre is closed you will be able to go to the viewing platform to look across the pit (picture). There is some information here and a high tech telescope, which can give you an overview of the site. That is about all you can see in the winter, so really is not worth the effort of getting to. Fortunately the information centre is staffed by a group of very friendly scientists, who came out and spoke to us. We described why we were there; mentioning this web site, and they invited us in. They put on a video in German explaining more about the history of the site, showed us some geological samples, gave us books and coffee, and at the end of our visit they even drove us back to the station; so Vielen Dank Susana and co. Inside the Information centre is the UNESCO certificate, behind a model of the small horses found in the mine. There is also a model of the new Visitors Centre that will be built in the next few years; it looks like a very impressive piece of architecture. Messel has a small railway station, no real platform though, on the Darmstadt - Aschaffenburg line. It takes about 40 minutes to get to Messel from Frankfurt so is fairly easy to visit. From the station it is about a 20-minute walk (there is no bus) out of town to the south. There is a small cycling sign pointing in the right direction and there is a path next to the road through the forest, and there is a large sign at the turn off from the road. I really enjoyed my visit here, mostly for the fantastic welcome and hospitality shown to us by the staff here. We did manage to get a good idea of the importance of the site from them and managed to see the pit itself, so I feel that I can count this as a proper visit even if we didn't manage to get down into the site itself. 2.5: Peter Loov Gary Arndt Daniel Chazad Antonio J. Purpose Built Visitor Centre: In Buffer Zone. 2010 ("The basic idea for the design of buildings was provided by the oil shale itself. The upright wall panels made of exposed concrete remind us of the stratification of the oil shale. Walking through the building, we get the impression alike to move through the different soil layers.The spatial structure takes us into another world. It has little in common with ordinary buildings and is rather reminiscent of a sculpture. Integrated into the outer envelope is the massive concrete wall of the former waste transshipment station. 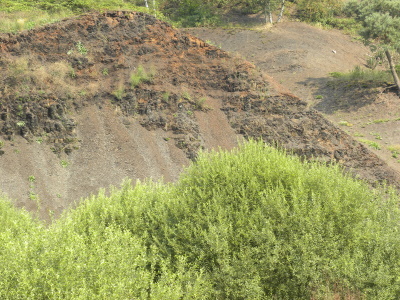 So prehistory and recent history of the Messel Pit were linked" (Odenwald.de). Forced labour during WWII: The factory that employed forced labour during WWII was operative in the core zone. 140 Community Members have visited.